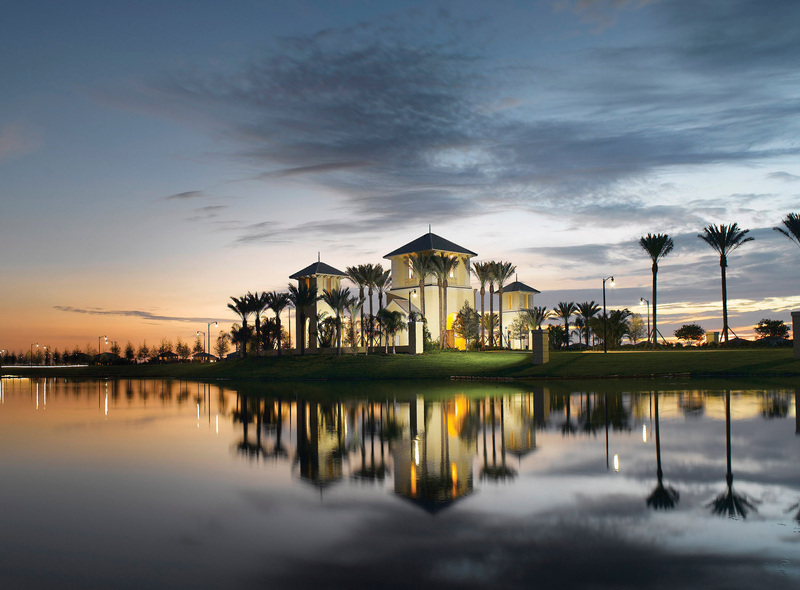 Located on Florida’s famed Treasure Coast, Port St. Lucie is the perfect place for Minto Communities’ LakePark at Tradition. Less than an hour from Palm Beach, surrounded by un-crowded beaches, championship golf, environmental preserves, cultural offerings, a wide range of dining and shopping, and easy access to I-95, the city was named one of the “Top 10 Best Places to Retire” in the U.S. by Portfolio.com and “Top 25 Best Cities to Retire” by Forbes Magazine. While collecting accolades for customer service, Minto has also persistently branded themselves as cutting-edge developers of sustainable and energy-efficient communities. The Florida Green Building Coalition recognized Minto as being one of the top 15 green builders in the entire state of Florida in 2015, and they are consistently ranked high from Eliant Customer Service Surveys. Through the use of the finest green technologies and products, Minto Communities has been crafting perfection in their high-end, active-adult, and certified green homes throughout Florida for years and LakePark at Tradition is no exception. Minto’s Isle single-family home model within LakePark at Tradition is 2,762 total square feet. It features covered entry, stunning archway details throughout, large great room and family room, den, gourmet kitchen, three bedrooms with luxurious master suite, 2.5 baths, covered lanai and pool area and two-car garage. A paragon example of their high-quality craftsmanship, Minto began developing the community in 2015 after they saw great sales success and the sellout of their TownPark neighborhood, also located within the master-planned community of Tradition. Currently, LakePark continues to be developed with 644 homesites scheduled upon completion. Inspired by the area’s small-town charm to create an environment of maintenance-free, vacation lifestyle home designs with resort-style amenities reflect the Neo-Traditional style of Tradition, but with a modern twist. LakePark offers single-family and villa-style homes, both with a two-car garage. Both designs feature distinctive rooflines with welcoming, covered entrances. Unique outdoor living areas are composed of enclosed lanais that provide luxurious comfort for relaxation and entertaining with very little upkeep necessary. Minto’s Coral Reef single-family home model within LakePark at Tradition is 2,916 total square feet. It features tray ceilings and many other architectural details, and includes three bedrooms, great room, gourmet kitchen, den, 2.5 baths, covered patio and pool, and two-car garage. The distinct interiors include bright and open great room floor plans that seamlessly transition from interior to exterior living space, a constant characteristic of the brand. “Other Minto hallmarks include high-ceilinged entry galleries; distinctive architectural details such as statement-making archways and tray ceilings; spacious designer kitchens with large serving and seating islands; luxurious master retreats with double vanities, large walk-in closets, baths with large walk-in showers with seating, and private guest suites located at the opposite end of the home from the master suite,” explained Svopa. Just a stroll or bike ride away from LakePark is a variety of national brand retailers and popular restaurants. The list of onsite amenities is also extensive, bringing a plethora of resources to residents for them to enjoy an active lifestyle when they are not already busy entertaining guests. The Club at LakePark features a state-of-the-art fitness center, resort-style swimming pool, shaded cabanas, screened lanai for social gatherings, outdoor seating area, grill area, event lawn, and even a dedicated dog park. Amenity offerings don’t stop within the limits of LakePark, either; adjacent to this neighborhood is TownPark, which all LakePark residents have full access to. TownPark offers a spa, resort-style pool, basketball, tennis, bocce and pickle ball courts, fitness center, and yoga studio. In addition, The TownPark Club hosts a billiard parlor, multi-media room with computer stations and library, and an activity room. With prices ranging from the $200,000s, LakePark represents a tremendous value for homebuyers looking to settle down and retire without reducing their active lifestyle. And for dubious buyers, Minto’s Stay & Play Getaway lets buyers test the lifestyle for three days and two nights, including golf at the nearby PGA Golf Club, all LakePark amenities, and more. The Club at LakePark features a state-of-the-art fitness center, resort-style swimming pool, cabanas, screened lanai, outdoor grill area, event lawn and resident dog park. Adding to the value of the home is the HERS-confirmed energy efficiency of each single-family and villa homes. Each is designed to provide significant savings to residents on utility bills and by partnering with venerable manufacturers in the home building industry that endeavor to bring sustainable and energy-efficient products forward, Minto was able to achieve their green goals. Highlights include: Low volatile organic compound (VOC) Sherwin-Williams® paints and Mohawk® carpet; complete stainless steel GE Energy Star® appliance package; energy efficient 50-gallon quick-recovery water heater; high efficiency Carrier® central air conditioning and heating, Moen® water-saving plumbing fixtures, and much more. LakePark is one of currently 13 neighborhoods within the uniquely master-planned community of Tradition Florida. The 8,300-acre award-winning, master-planned, and mixed-use community opened in 2003, and by 2017 was ranked as one of the country’s “Top 50 Best Master-Planned Communities” by John Burns Real Estate Consulting. Although the 13 featured neighborhoods vary in lifestyles, offerings, and amenities, as a whole the master-planned community boasts over 500 acres of sparkling lakes, parks, nature preserves, neighborhoods parks, and playgrounds, all linked by miles of pathways for additional walking and biking. To date, five communities are completely sold out, and seven are actively selling with one coming soon. Minto will continue their legacy with three new communities planned to launch in 2017 and early 2018, Westlake in Western Palm Beach County, Latitude Margaritaville in Daytona Beach, Fla., and Latitude Margaritaville in Hilton Head, S.C. “Minto Communities and Margaritaville Holdings are redefining active adult living in a new partnership to develop active adult communities inspired by the legendary music and lifestyle of singer, songwriter, and best-selling author Jimmy Buffett,” explained Svopa. “Latitude Margaritaville communities, designed for those seeking a uniquely fun, relaxed lifestyle, will be developed in key locations around the U.S.” Currently, Latitude Margaritaville Daytona Beach is underway, with the sales center slated to open by fall 2017; and Minto recently announced Latitude Margaritaville Hilton Head with a sales center opening projected for early 2018. For information on LakePark at Tradition and other Minto communities, visit www.MintoUSA.com or call (844) 449-4789. Sergio Flores is an Editor for Green Home Builder magazine. He may be reached at sergio@penpubinc.com.